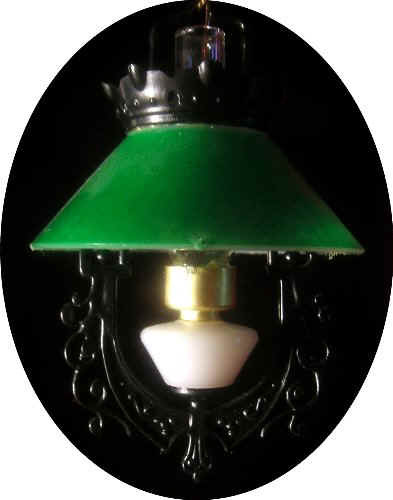 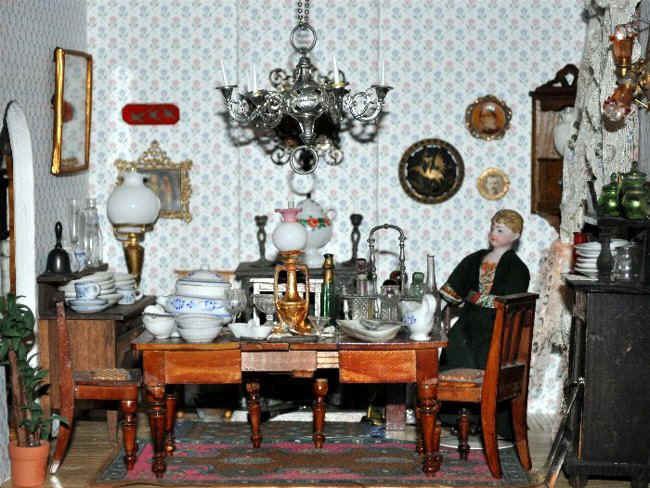 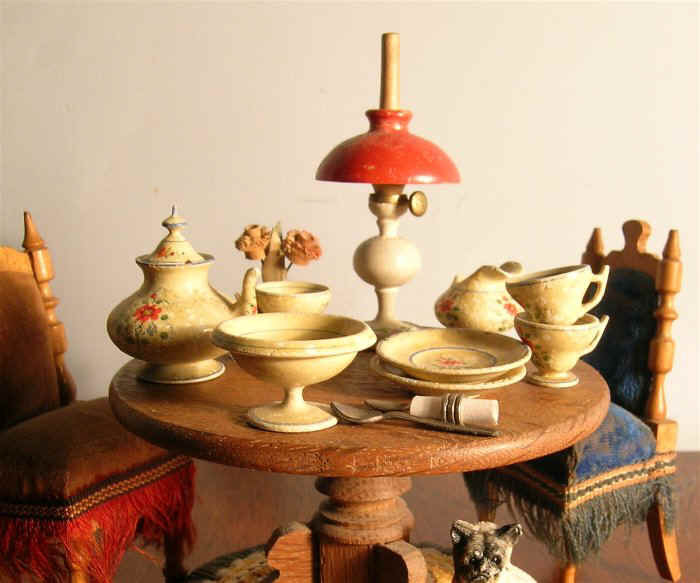 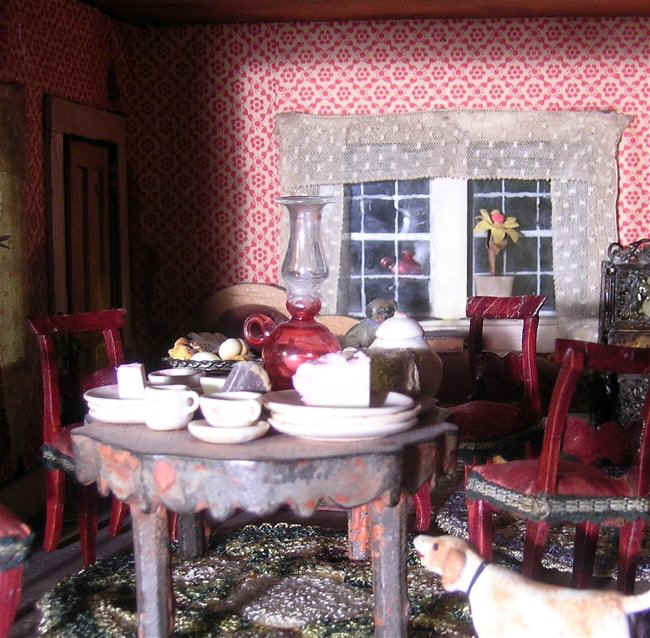 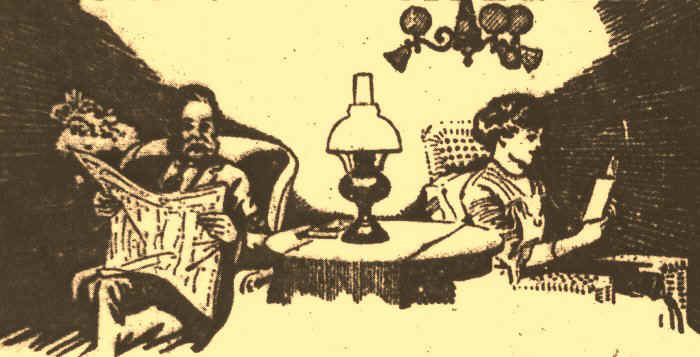 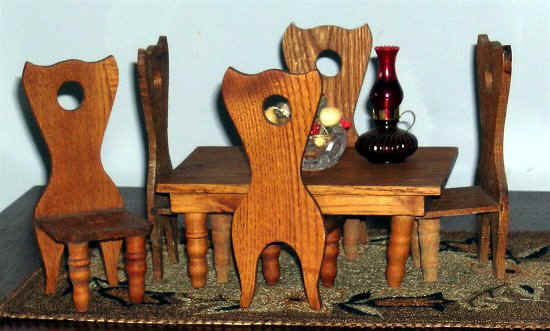 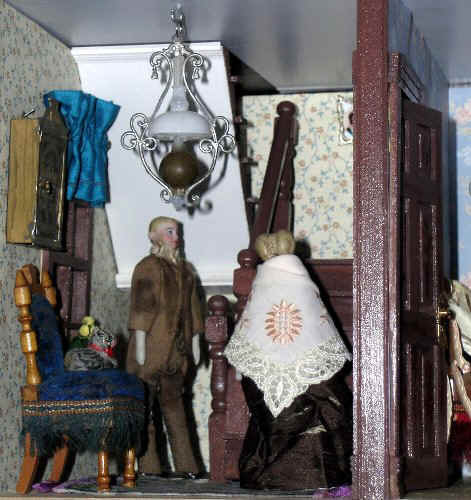 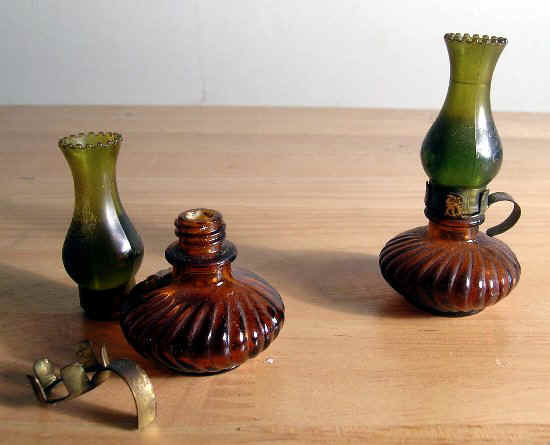 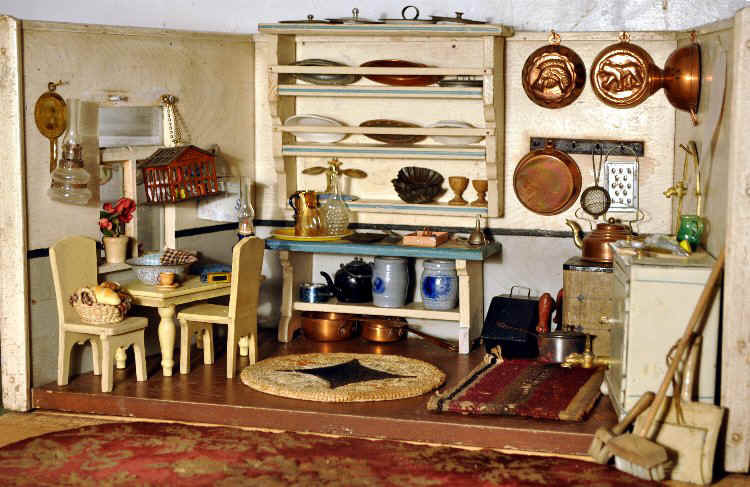 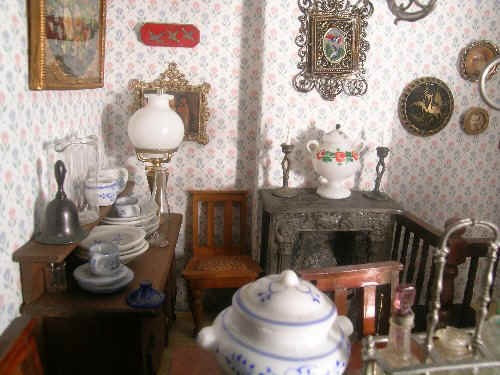 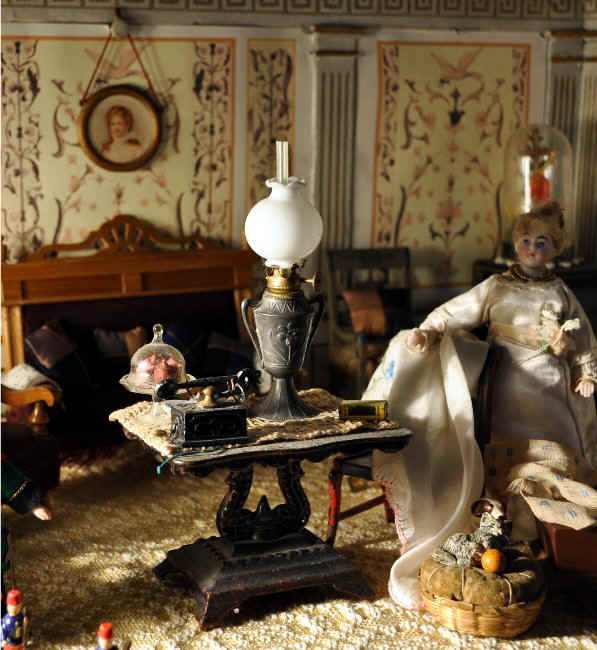 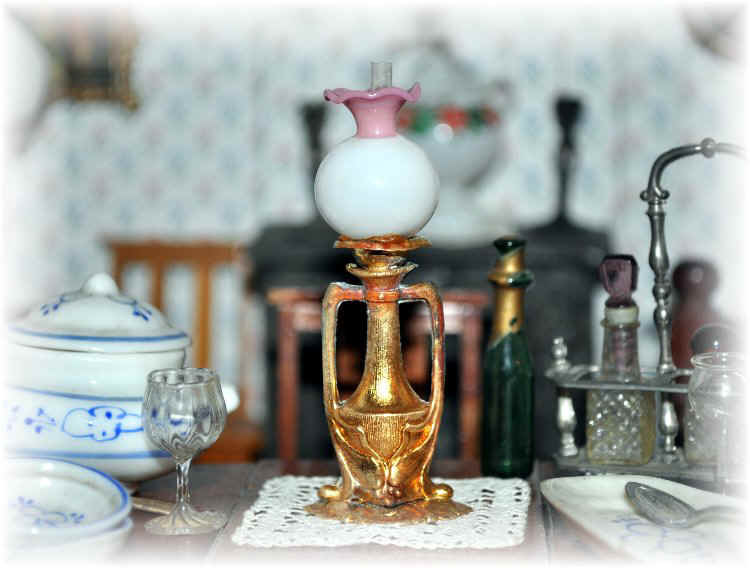 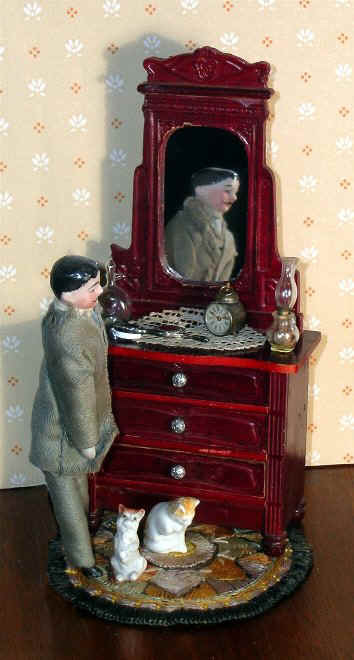 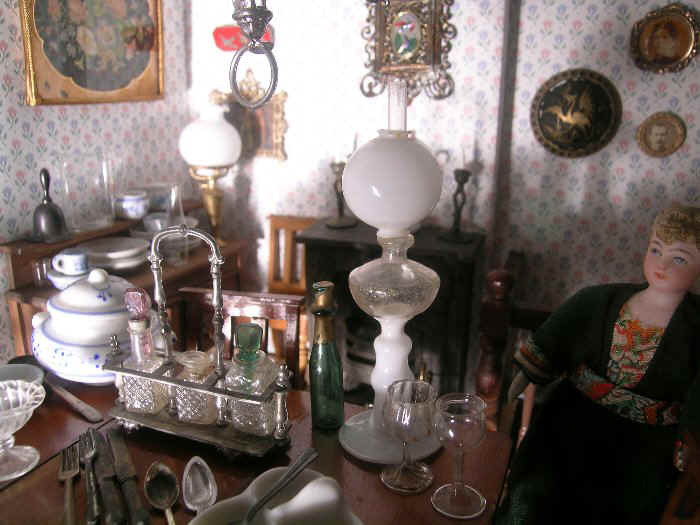 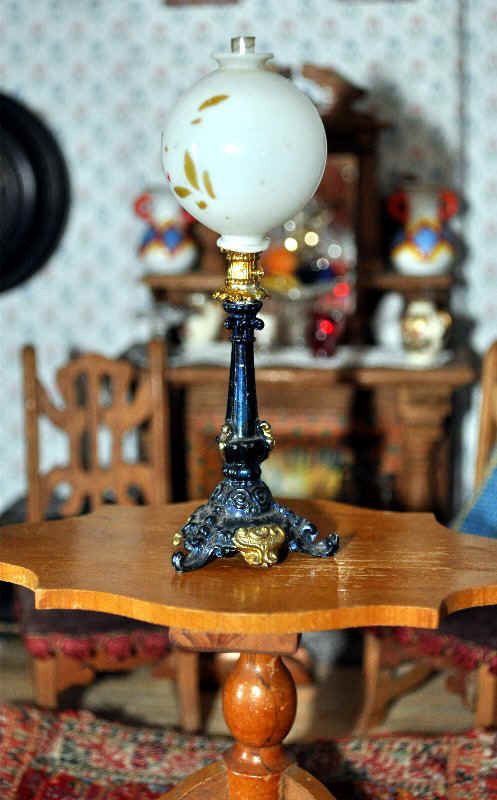 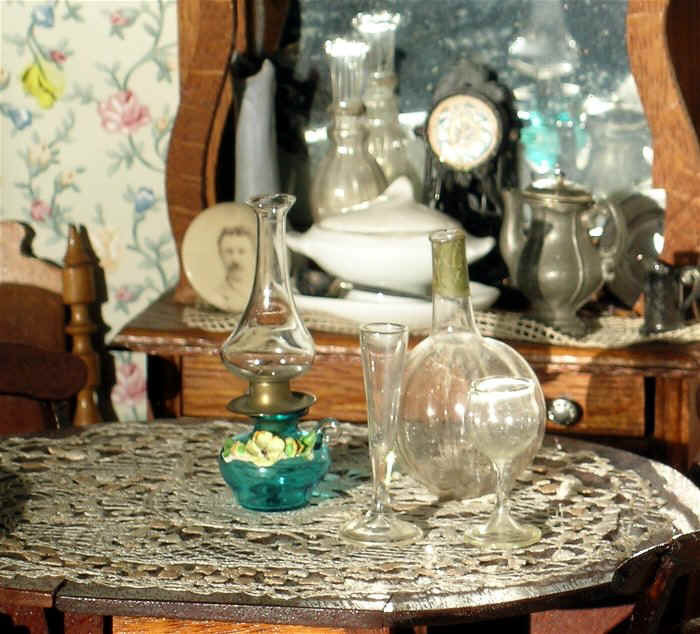 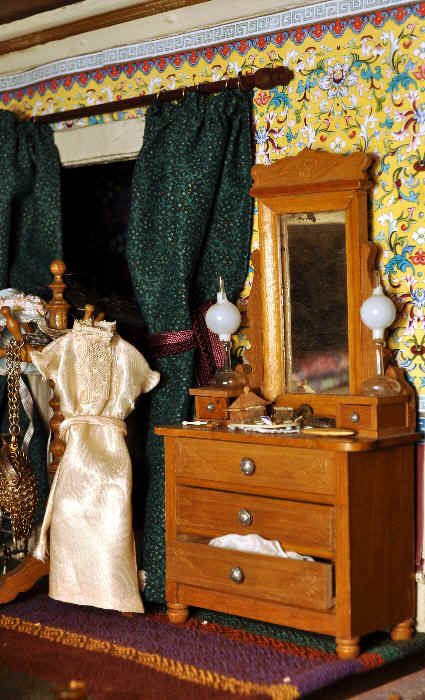 Although the fuel for oil lamps originated from coal ("coal oil") in the 1850s, by the time of the dollhouses under study the source was petroleum and the name usually applied was "kerosene". 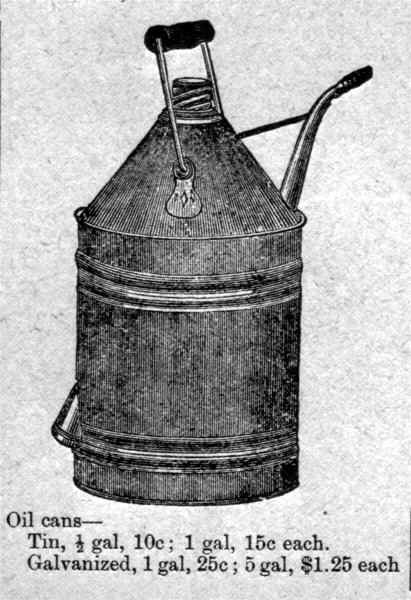 As earlier as the 1860s, this product became widespread due to its relatively inexpensive cost and reputation for providing a clean and safe burning fuel. 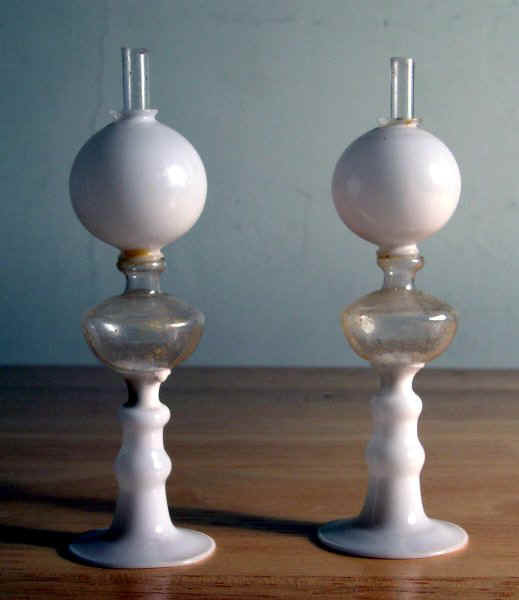 There had been earlier liquid or semi-liquid fuels such as lard (animal fat), whale oil and camphene (alcohol and turpentine) but each had individual disadvantages regarding quality of light or cost or safety. 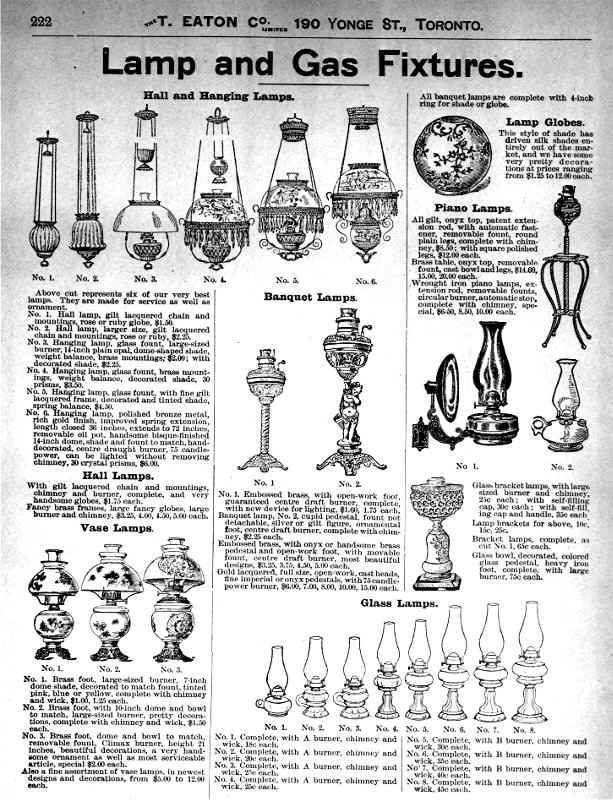 Throughout the time when all of these -- including kerosene -- were in use, candles continued to be used but they became secondary to kerosene. 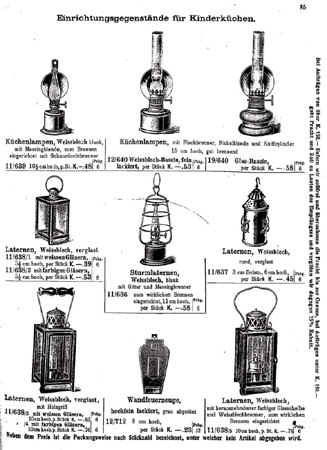 The latter remained the primary source of lighting well into the era of electricity, which could be unreliable due to power failures, and for folks living in areas not serviced by electricity. 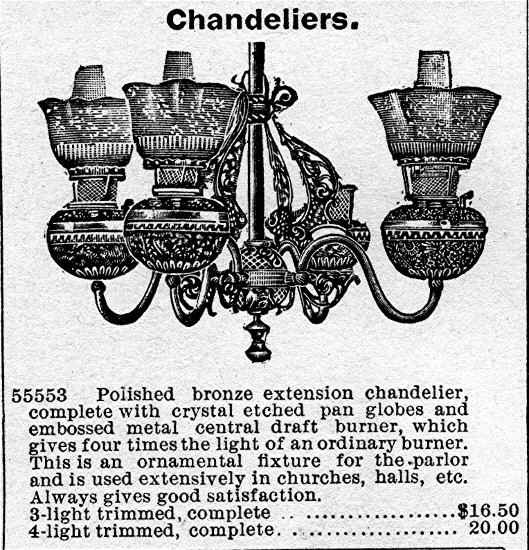 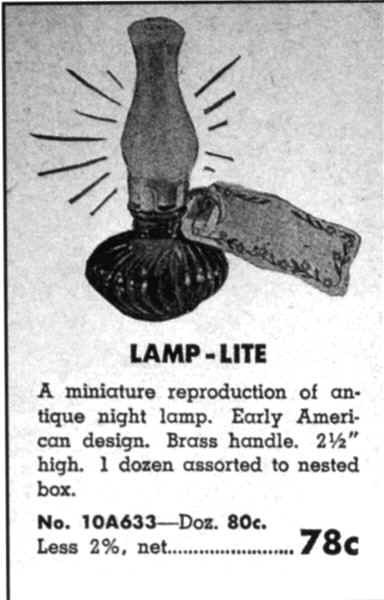 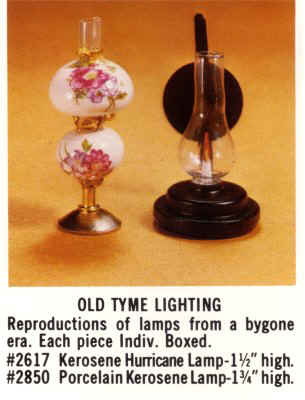 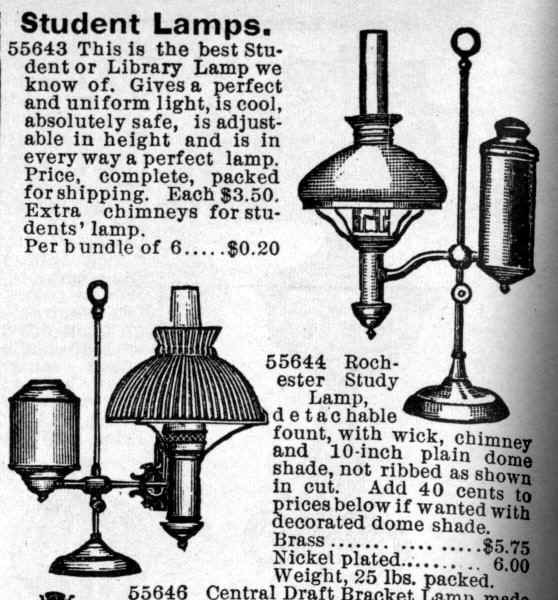 Oil lamps were a stock product of mail order catalogues into the 1940s. 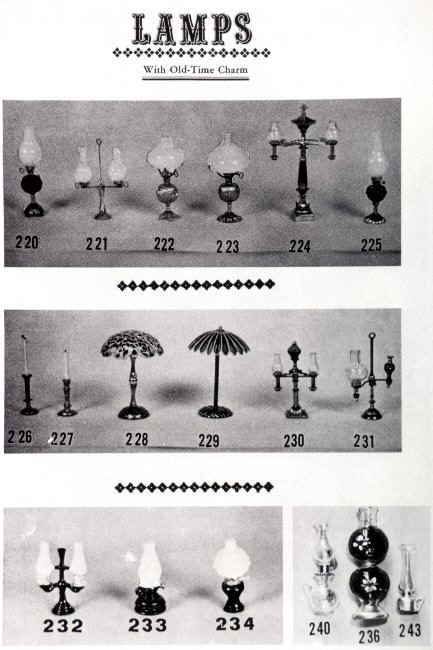 It can be difficult to distinguish whether a miniature light fixture represents one made to burn oil or gas, as both may incorporate large shades to diffuse the light. 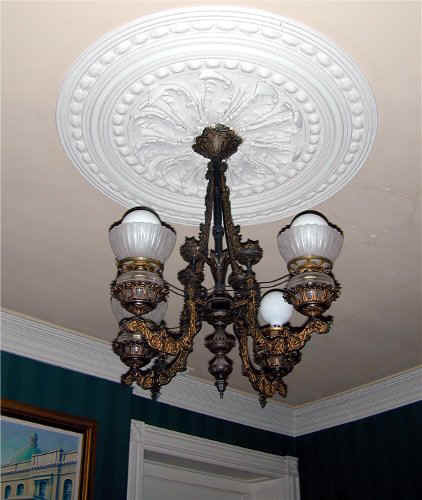 Gas fixtures, however, need to be attached to a fuel line positioned in the ceiling for hanging lamps or in the walls for scounces, whereas oil lamps can be free standing (or hung as a chandelier anywhere on a ceiling). 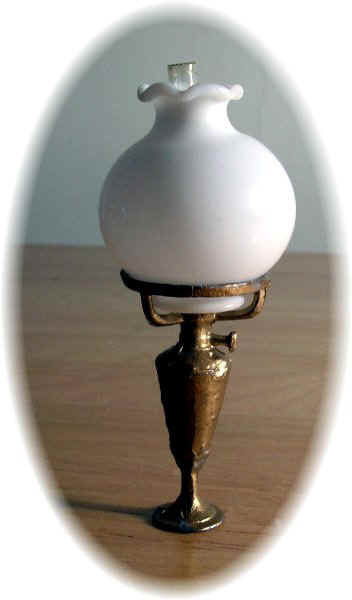 Gas fixtures do not need a reservoir to store fuel, whereas oil lamps need such a font, resulting in the characteristic bulging area between the base and burner. 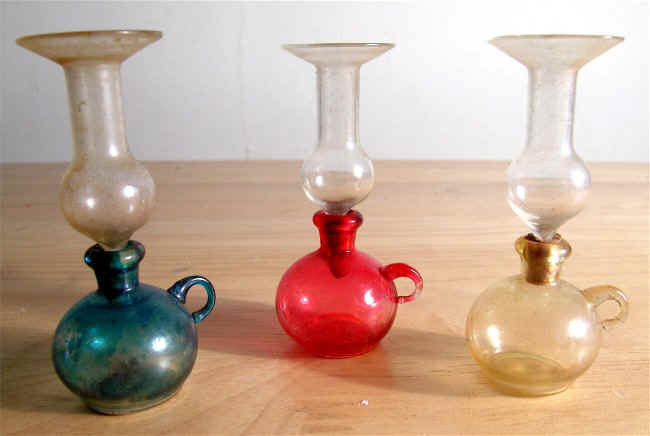 Unlike oil lamps, gas ones do not need chimneys to protect the flame but may have shades to diffuse the light. 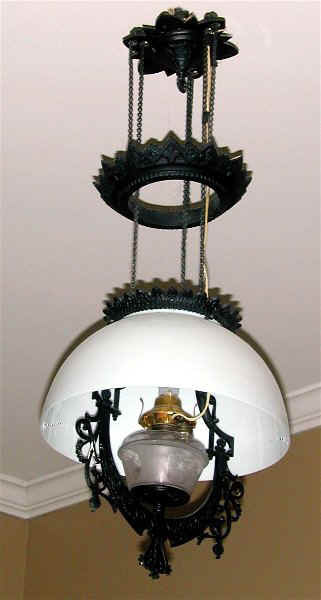 Gas and oil fixtures direct the flame upwards (unlike electrical fixtures, which can aim the light downwards). 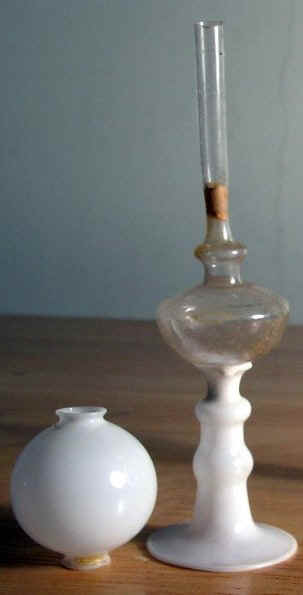 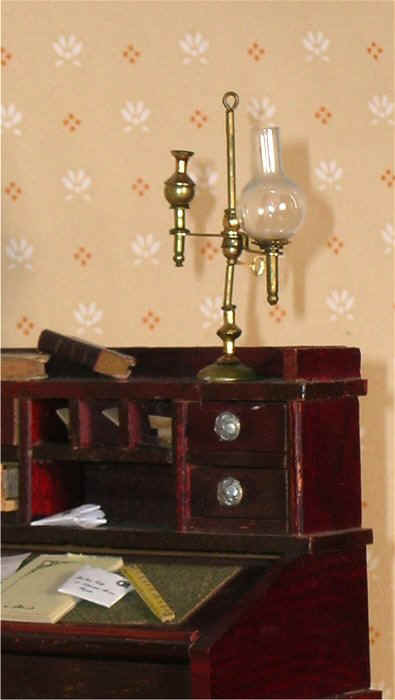 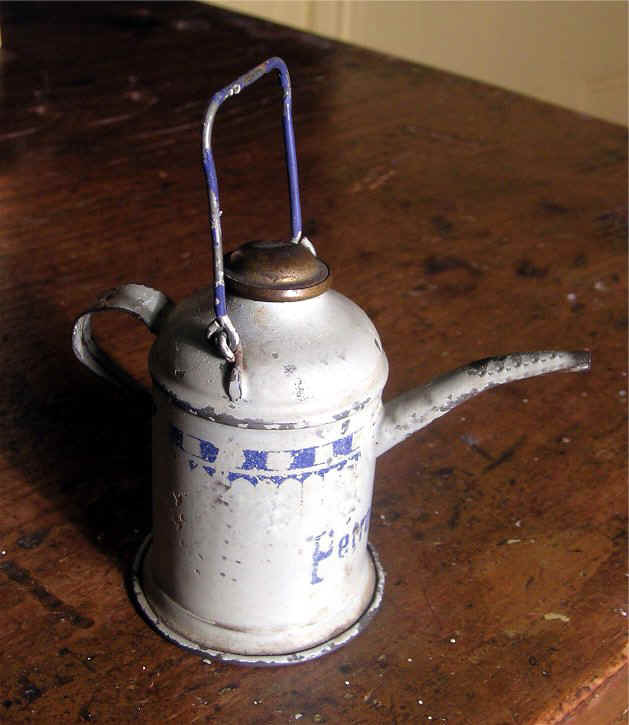 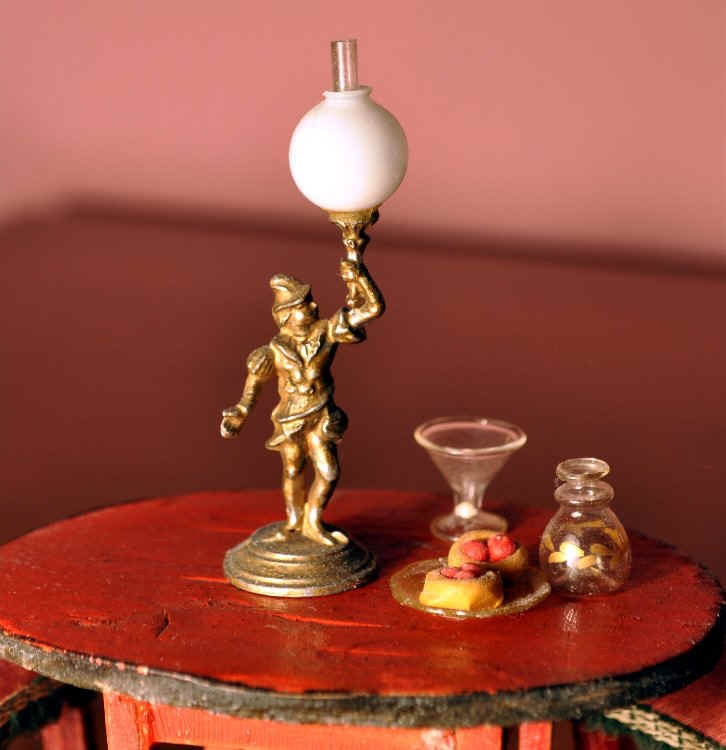 Oil lamps have wicks and metal burners but these are often not included in miniature versions. 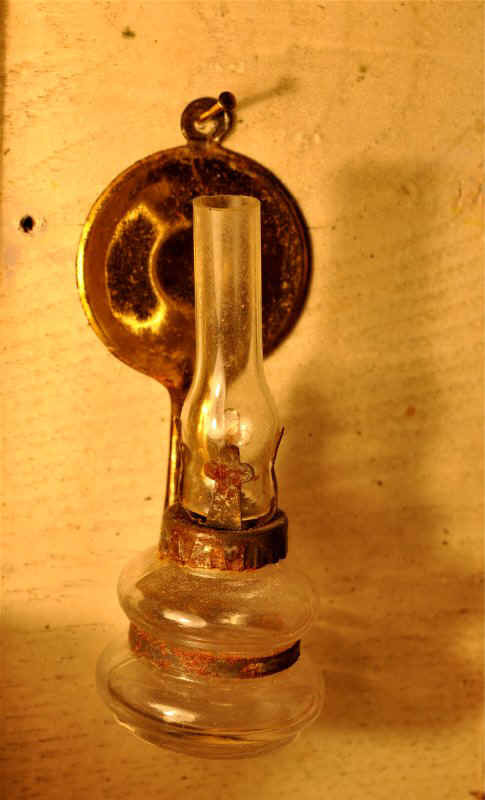 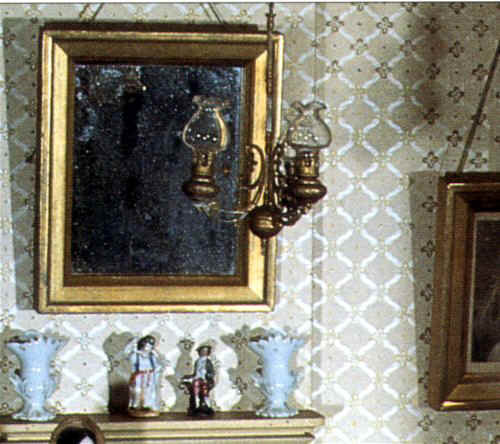 At the most, there may be a cork or brass connecting device between the chimney and reservoir. 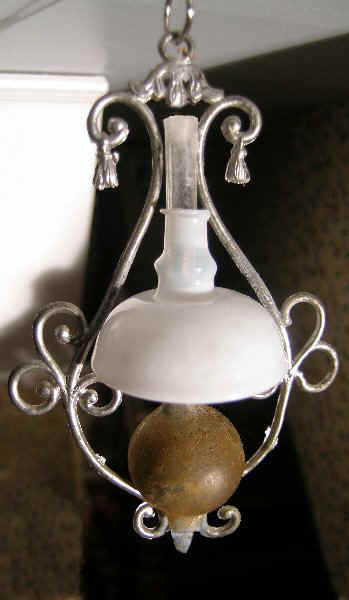 Dollhouse glass and metal vase lamp, likely German, late 19th - early 20th centuries, a bracket supports the white shade with its elegantly fluted lip, the thumb wheel for raising the wick is represented at the base of the "burner"
For readers interested in products made by the Erhard & Söhne Company, see Swantje Köhler, Ormolu Dollhouse Accessories, Metal Toys from the Erhard & Söhne Company, 2007. 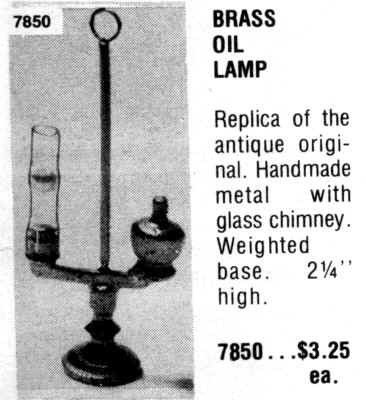 Metal oil lamp shown in the Der Universal-Spielwaren-Katalog of 1924-1926 (but likely made even earlier) with an embossed floral design and two handles. 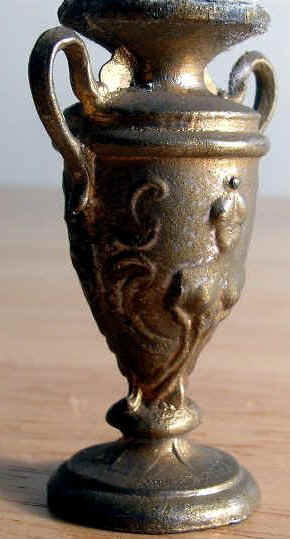 The metal portion is 2½ inches high. 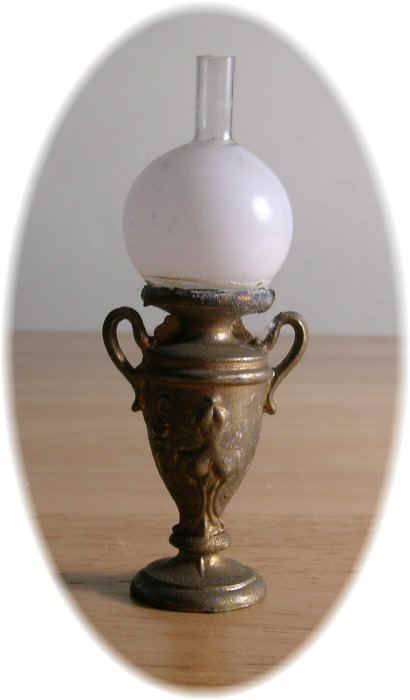 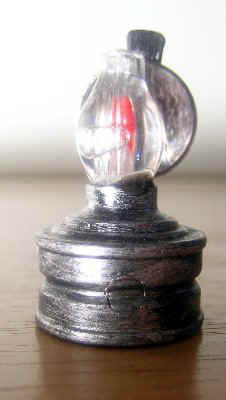 It may have actually produced light, as there is a wick that can be adjusted by turning the thumb-wheel. 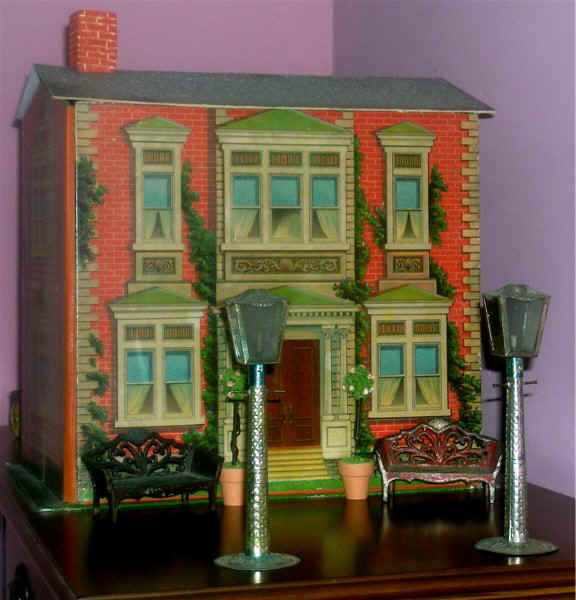 Did it light a doll house? 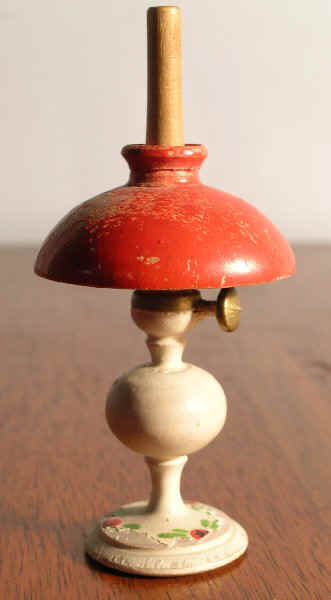 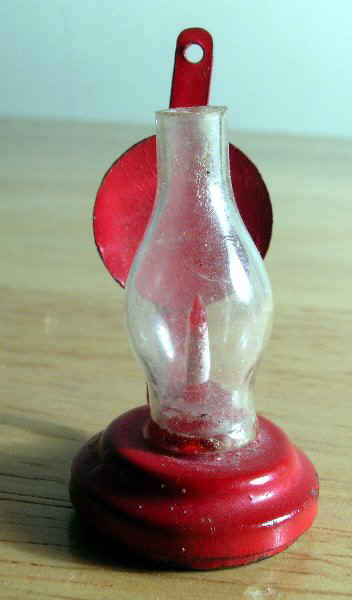 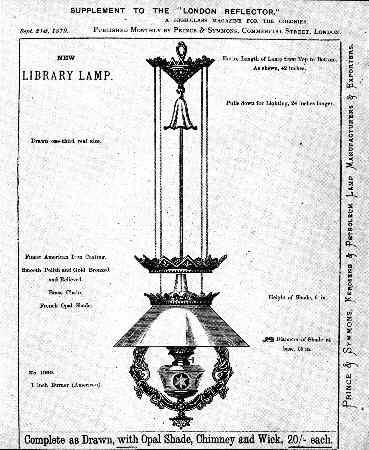 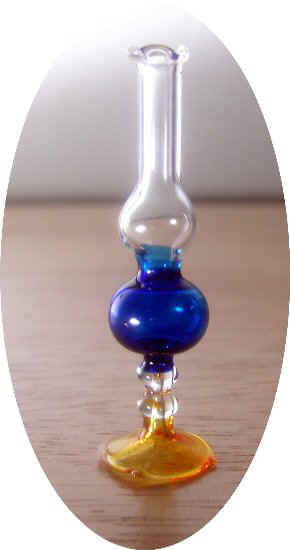 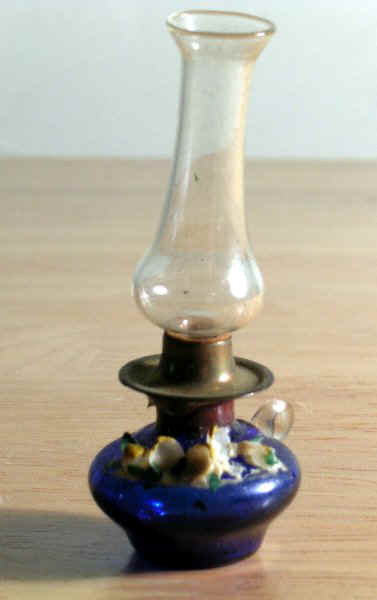 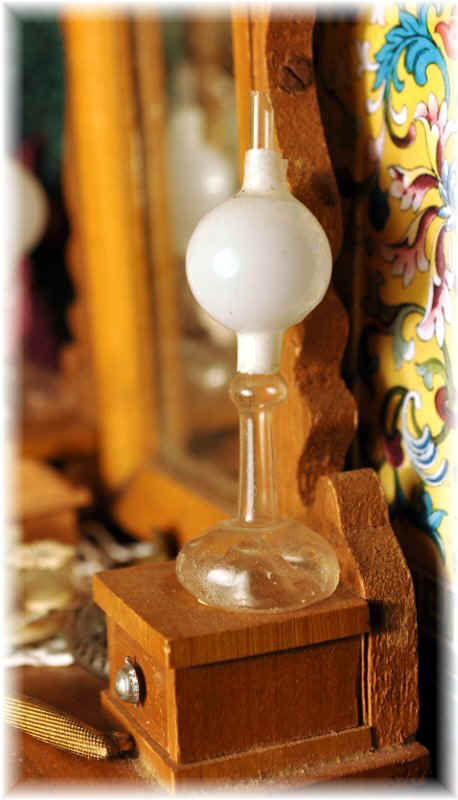 The original glass globe with integral tube, shown in the catalogue, was held in place by prongs. 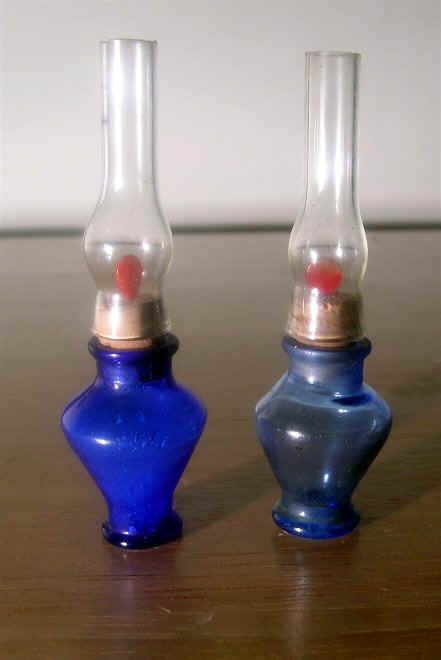 The one shown on the right is old but a replacement.